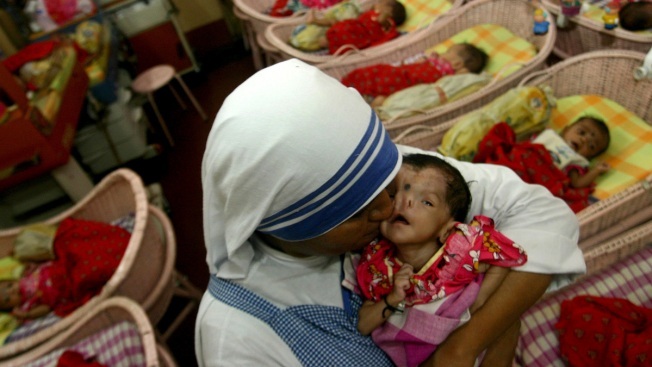 In this Aug. 21, 2007 file photo, a nun of Mother Teresa's Missionaries of Charity kisses a handicapped infant at Shishu Bhavan, a home for orphaned children, in Kolkata, India. India's government on Monday, July 16, 2018, ordered inspections of all centers run by Mother Teresa's charity following the arrest of a nun and a worker at one of its shelters for unwed mothers for allegedly selling a baby. India's government has ordered inspections of all centers run by Mother Teresa's charity following the arrest of a nun and a worker at one of its shelters for unwed mothers for allegedly selling a baby. The arrest early this month followed a complaint by an Indian couple that they paid 120,000 rupees ($1,760) to Anima Indwar, who worked at the shelter run by the Missionaries of Charity in Ranchi, the capital of Jharkhand state in eastern India. Police said they were investigating three other complaints. Women and Child Development Minister Maneka Gandhi ordered that child care homes run by Missionaries of Charity be inspected immediately, a government statement said Monday. 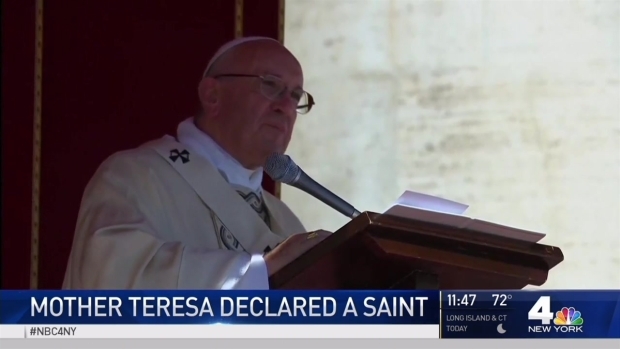 Pope Francis declared Mother Teresa a saint on Sunday, honoring the tiny nun who cared for the world's most destitute and holding her up as a model for a Catholic Church that goes to the peripheries to find poor, wounded souls. David Ushery reports. Missionaries of Charity spokeswoman Sunita Kumar declined to comment on the government statement. Soon after the arrests on July 5, Kumar said the Missionaries of Charity was investigating, but that "there was no question of selling any child as the Missionaries of Charity had stopped giving children for adoption three years ago." Mother Teresa started the Missionaries of Charity order in Kolkata in 1950 and it later set up hundreds of shelters that care for some of the world's neediest, people she described as "the poorest of the poor." She received the Nobel Peace Prize for her charitable work in 1979 and Pope Francis declared her a saint last year, two decades after her death.